Working in cold conditions is bad enough, but when you add in wetness, it can seem impossible to stay warm, comfortable and protected. 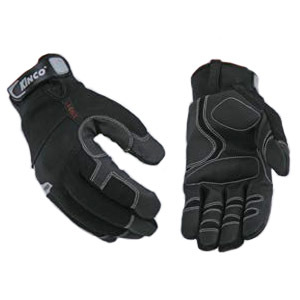 The Kinco Aquanot Lined Cold Weather Gloves 2051 are made to keep your hands warm and dry, while still allowing you all the grip you need to get the job done. A combination of XtremeGRIP!, HeatKeep and AquaNOT! 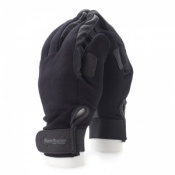 materials provide excellent protection, giving you all the comfort you need in virtually any conditions. If it's already cold outside, the last thing you need is rain getting inside your gloves to make the cold even worse. The AquaNOT! 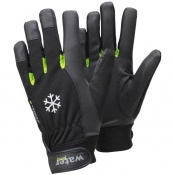 lining in these gloves is completely waterproof, and is designed to keep you warm and dry so you can get on with your work. To keep debris and wetness away from your wrists, the gloves feature a rubber hook and loop strap for a snug wrist closure. Most gloves lose grip in warm or icy conditions, leaving you with plenty of frustration as well as potential hazards to safety. These gloves are designed with XtremeGRIP! reinforcing and gripping material on the palms and fingertips, providing you with all the grip you need in almost any conditions. 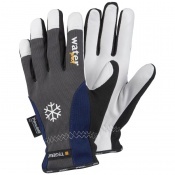 No more fumbling with tools in the cold and rain, as these gloves will have you working without all the hassle. These gloves are serious about keeping your hands warm and comfortable, featuring patented HeatKeep full sock thermal lining to keep all your warmth inside. Made of finely spun polyester fibres, this lining creates thousands of air pockets that surround the hand, trapping all your natural body heat while repelling cold from the outside. Complete with layers of nylon batting and nonabsorbent polypropylene, this material wicks water away from the hands to keep you dry and outperform other leading insulators on the market. To determine which size of glove is right for you, measure the distance from the inside of your thumb to the outside of your little finger. To ensure accurate sizing, measure your dominant hand.